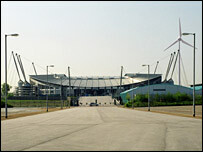 The City of Manchester stadium is set to become the first in the world to be powered by its own wind turbine. Manchester City Football Club has been granted planning permission to erect an 85m (279ft) turbine, which will also generate power for nearby homes. The structure, designed by Sir Norman Foster, will be one of the UK's largest land-based turbines and should dwarf the nearby B Of The Bang sculpture. Manchester City Council said it would be operational in 2007. Planning spokesman Neil Swannick described the development as "an iconic statement of Manchester's commitment to renewable energy". "East Manchester has a long history of energy production, it is therefore fitting that the area is pioneering the provision of renewable energy in the city," he said. Pete Bradshaw, the club's social responsibility manager, said: "The wind turbine provides an exciting opportunity to help the club and the city achieve significant carbon emission reductions." The three-bladed turbine, provided by independent power company Ecotricity, will produce about two megawatts of electricity. Dale Vince, managing director of Ecotricity, said: "The club's new green electricity supply won't be costing any more than it's old supply - actually it will cost less." The blade tip of the turbine will reach 120m (394ft), while the nearby B Of The Bang sculpture stands 59m (194ft) tall. Manchester's latest addition to its skyline - the Beetham Tower - climbs to 168.87m (554ft).